The Land Before Time is a film directed by animation legend, Don Bluth, about the journey five young dinosaurs make to find the “Great Valley” for refuge in times of terrestrial catastrophe, while also seeking to reunite with their loved ones. 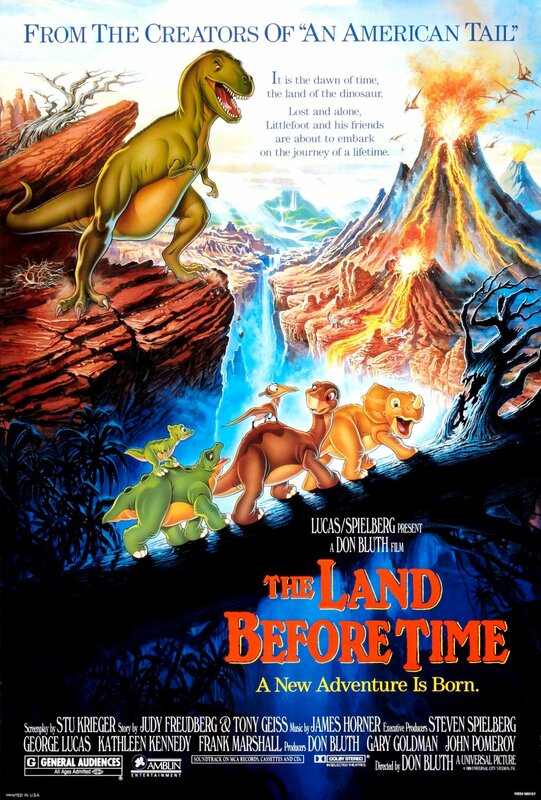 This is Bluth’s third directorial effort after his work on The Secret of NIMH and An American Tale, and even though Bluth faltered a bit with An American Tale, I believe he got back onto his feet with The Land Before Time. The film is a story revolving around the young Apatosaurus, Littlefoot, as he journeys with his mother and grandparents to the Great Valley to find a place to eat and live after their home was negatively affected by Earth’s ever-changing conditions. Littlefoot as a main character is likable and easy to root for, as he shows a genuine naivety towards the norms established by his elders, but is also pretty strong-willed and shows good character as the story progresses. While on his journey he meets up with four other dinosaurs named Cera, Petri, Spike, and Ducky, all of which have their own little quirks that make them unique. Every one of these characters are likable as well, even Cera who is a bit of a pain to the team. She may be proud, arrogant, and a bit prone to altercation, but she understands that companionship is valuable and she comes around when it’s needed most. With any mean aspect of the character, I would chock it up to the attitudes of her father. With this, I thought the film did a good job in presenting prejudice and how it spreads and how it can be diminished. Cera learns her prejudice against “long-necks” through her father and doesn’t want to associate herself with Littlefoot. Littlefoot’s mother even accepts the disconnect between the two genuses, as she says “it’s just the way it’s been” and only communicates with her own kind. Bluth effectively shows that prejudice is a learned behavior, and through the journey the children make they find out that these preconceived notions about certain “types of people” (or dinosaurs in this instance) can be thrown out the window. The film also does a good job about showing perseverance and not taking the “easy way out” when it comes to accomplishing a goal. The extra push from the more difficult journey helped build the character of the group and drew these characters closer together. Both of these messages are important to present to younger children, and I say that this film caters itself to young children well. It really is a film meant for pre-schoolers and I don’t mean that disparagingly necessarily; the plot isn’t too complex and the characters aren’t exactly complex either. They show growth, but it’s more of a traditional approach towards going about it. The humor is also geared a bit more towards a younger audience, as the comic relief is entrusted with Petri who displays more physical comedy than actual jokes. The film is also a bit “cutesy” with the design of the baby dinosaurs and the “cute” scenes of them hatching from their eggs. I don’t think that these are bad aspects of the film, but if you’re looking to show this to a kid that’s around five or six, they would probably check out before the first ten minutes. Even though the film is a bit infantile, it packs a lot of emotion. I guess spoilers here if you don’t want to know about a certain character’s fate, but I think everybody’s at least heard about or seen this. SPOILERS HERE The death of Littlefoot’s mother would be pretty devastating to a little kid, as they see themselves in Littlefoot and would not want to lose their mother either. It’s even more depressing to think about as Littlefoot has nobody to look after him as the land has been split in two, separating him from his grandparents. He has to travel to this unknown land alone, until he meets with his eventual companions. The scenes of him seeing apparitions of his mother are pretty sad as well, as he truly believes his mother’s alive to see him again, only to be disappointed that it’s only his own shadow or a cloud formation in the sky. SPOILER FREE I don’t think these scenes are too sad to show a two or a three year old, as there’s enough fun and optimistic moments throughout, but just know it does get a bit emotional in parts. Visually, the film is quite the marvel. The vast landscapes ranging from the dying land of old with its stunning reds and oranges to the grandiose reveal of the lush oasis called the Great Valley, rich with deep greens and refreshing blues. The animation overall is pretty good too, as there were only a few weird bits of animation stills laced throughout. One thing I thought was really interesting though, was the way they presented size and scale. With one scene in particular, Littlefoot’s mother moves her head from the background to the foreground and it takes a few good seconds. Usually something as mundane as moving one’s head would take a quick second, but they take the time to show how long it would take to move this large creature from one location to another. The designs of the dinosaurs are pretty nice too, as I mentioned before the baby dinosaurs are cute, but the adults bare a more realistic look to them. The T-rex is especially intimidating with its devilish eyes, its razor-sharp teeth, and its towering presence. The Land Before Time is an animated film that delivers a great deal emotionally and visually, and presents a great message to younger audiences. The film is a bit infantile though, as there isn’t much for an older audience-member to enjoy plot-wise, as it’s a bit standard in its story-telling. It also feels a bit “handholdish” with its narration, as we’re being told what it happening right in front of us. I thought it would’ve been better to let the audience just absorb the events of the scene visually, but I understand the film is geared for a much younger audience. 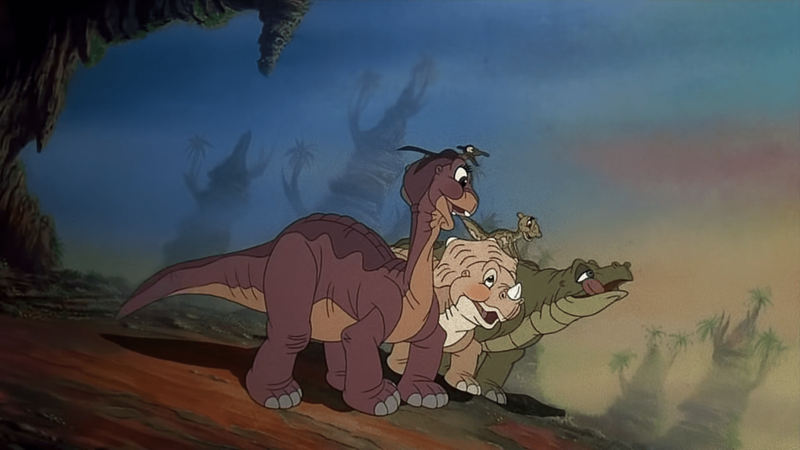 While it may not have the gravitas or the cross-generational enjoyment of a Pixar or Disney Renaissance-era film, The Land Before Time is an enjoyable adventure film for younger audiences.